It seems oddly appropriate to talk about security today. Between malware and identity theft, everyone has more to think about these days. Many services are adopting multi-factor authentication in order to better protect their users. This generally involves a little dongle attached to your keychain that reads out a new, random number after a short period of time. In a multi-factor authentication system, you input your password and the number off this device. The first factor of authentication is your password (which can be compromised, often through social engineering—that is, tricking you into revealing it) and the second is your possession of this device (otherwise you can’t know the number). While this works marvelously, your key ring starts to look like a janitor’s after you collect more than a couple of these devices. If only there were a way to get that functionality out of something you already own and carry with you everywhere—like, say, your iPhone. It’s with that in mind that VeriSign released an iPhone app for this very purpose. For now, the VeriSign app is primarily for use with eBay, AOL, and Paypal. In the future, your bank could support it. 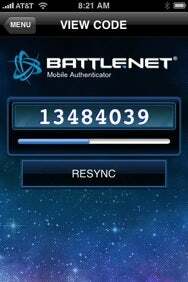 If you’re like me and you play World of Warcraft, there’s another app available for keeping your account safe from gold farmers: Blizzard’s recently released Battle.net Mobile Authenticator. I’ve been using it for a few days now with no problems. Take today as a reminder that it’s never too early to start securing both your computer and your online transactions. Besides, you know you get a little satisfaction out of having yet another little icon waiting there for your use.